In the various Temari groups I belong to we often share images of or links to Temari we love. One got shared last year and while I had seen this Temari before but had never quite realised how truly huge it was. Like most Temari makers I like to *try* to reverse engineer Temari from photographs I see. My biggest stumbling block is determining the size of the Temari that I am trying to work out. If the image has something of known dimension it is much easier to reference the size of the Temari... but let's face it, usually the it is alone on a plain background or amongst a group of other Temari (whose dimensions are also unknown). Would you have guessed the right size without the reference point? I have been making studies of several Temari images that were passed to me many months ago. 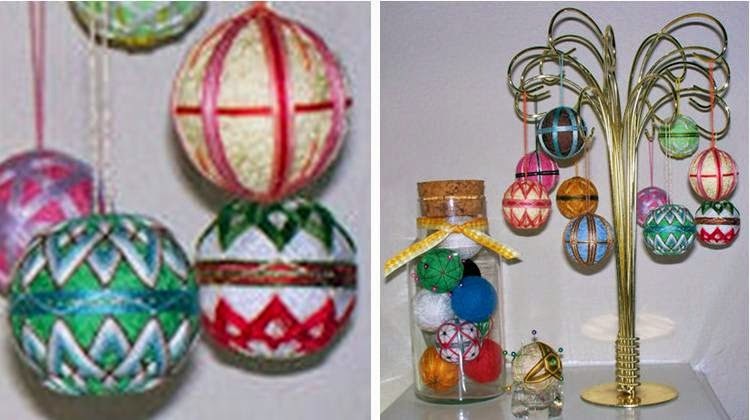 One of these Temari was in an image passed to me by a friend that visited an exhibition several years ago in Japan. True to form, this Temari was pictured alone on a plain black background (not a reference point in sight), so could I work out how big it is?? Well I didn't really know the right answer so what I ended up doing was just having a guess and hoping I was right. Well this was the long way to get the job done... in fact it took me 3 Temari to get it right (or at least close to right). I admit that the first Temari was done smaller that I thought it would need to be just because I wanted to work out my theory for the layering of the banding. In hindsight perhaps there are a couple ways to work it out. 1. How many rows are in a band or area in the front of the image? What is the thread used? For me laid side by side I know the 10 rows of #5 Perle cotton is about 10mm (1cm) so referencing that I can work out how many rows there are and use that to judge the diameter of the base. 3. Can I see a whole shape face on a C8 or C6? Many years ago we had access to an online Temari Calculator created by Debi A. If I could measure a side or a long line in a shape I could put in various numbers into the calculator and determine the size of the Temari (for example a 5cm pentagon side is a 43.5cm circumference base) I wish we could still use that resource, I'm no math guru and have no idea where to start on creating my own although I have made my own calculator for simple divisions... if it was an app I'd buy it in a heartbeat. 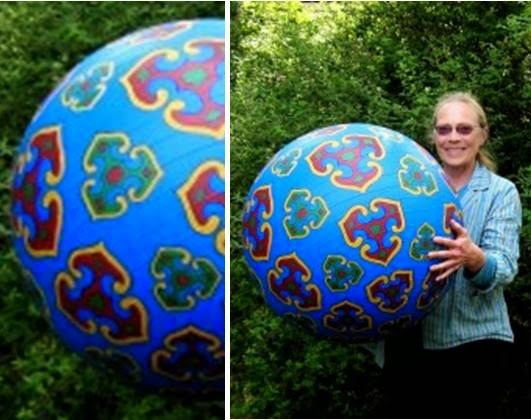 So how do you work out the size of a Temari from a photo?